Madonna first hit the road in the spring of 1985. She performed a total of 41 arena shows across the US and Canada. The Virgin Tour premiered in Seattle on April 10 and wrapped up in Madison Square Garden, New York City on June 11. The Virgin Tour promoted Madonna's first album and her recent Like A Virgin album. She also added Crazy For You and Gambler, from the movie Vision Quest, and Into The Groove from Desperately Seeking Susan. Compared to her later tours, the Virgin Tour had a small crew with only two dancers. Director Daniel Kleinman filmed the Detroit show of May 25, 1985. 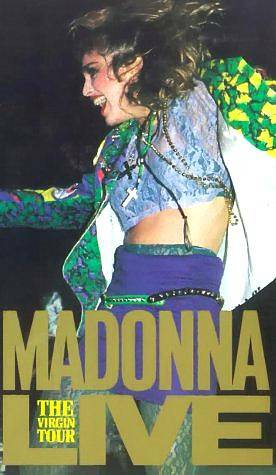 This recording was released as video album on Nov. 13, 1985, titled 'Madonna Live: The Virgin Tour'. Kleinman removed the performances of Angel, Borderline and Burning Up because he believed Madonna was not her best in them. The recording was available in VHS format and later as laser disc, but it never got a DVD release. 'Madonna Live: The Virgin Tour' was the top selling music videocassette of 1985, peaking at #11 of Billboard's Top Music Videocassettes chart. The RIAA gave it a Double Platinum certification for the shipment of 200,000 copies.